Every hour or at your command this remarkable timepiece will play the first 20 musical notes (20 seconds) of the song “Strangers in the Night” in a soft crisp tune. 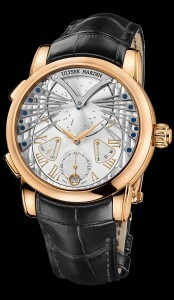 It is a 44mm, 18K polished rose gold case, automatic movement, with a date function. The solid rose gold case back is engraved with the title song “Strangers in The Night”, an image of a piano keyboard, and the limited edition number of the watch. It is available on elegant black color crocodile leather strap with a rose gold folding buckle.